Heart disease is the number one cause of death for both men and women in the United States. If you are concerned about preventing heart disease and taking better care of your body, one of the best ways to start is by making a few dietary changes. We all know that eating more fresh foods like green, leafy vegetables and lean proteins is important. Doctors and nutritionists also recommend avoiding trans fats completely, as these raise our “bad” cholesterol levels. Many prepackaged snack and dessert foods contain trans fats, so it’s always important to take a look at labels and become aware of the food we put in our bodies. However, just because we’re eating healthily doesn’t mean we can’t have dessert! 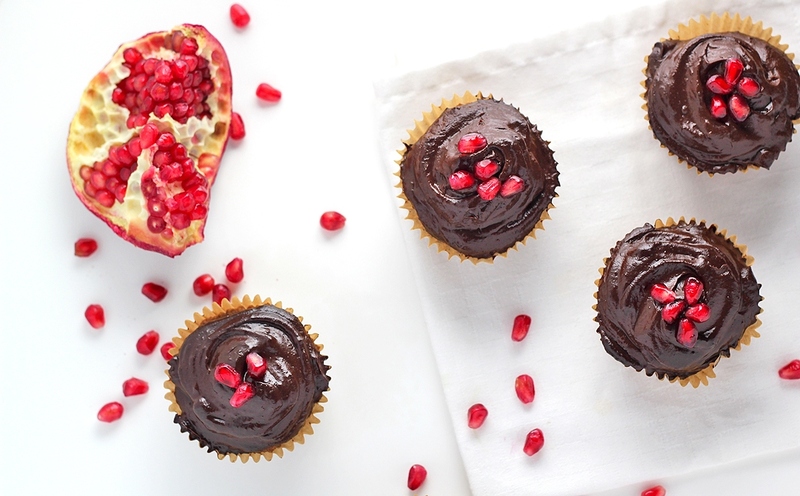 These almond chocolate cupcakes with avocado frosting are made from ingredients that are important for a heart-healthy diet (like almonds, avocados and pomegranate seeds) and are free of trans fats! These cupcakes are also free of refined sugar and are sweetened naturally with pure maple syrup. For a sweeter cupcake, add stevia to taste; or to reduce the amount of sugar, reduce the maple syrup and increase the amount of stevia. Since almond flour is used for the base of these cupcakes, they are both gluten- and grain-free as well as dairy-free, so this recipe can accommodate a variety of diets in addition to being heart healthy! 2. Combine almond flour, eggs, maple syrup, baking soda, vanilla extract and cocoa powder. Mix well and ensure there are no lumps. 3. Pour batter into cupcake liners, filling them about halfway. 4. Bake for 15 minutes, or until a toothpick comes out clean. 1. Add the avocados, maple syrup, cocoa powder, almond milk and stevia (if using) to a food processor and process until smooth, scraping down the sides with a spatula as necessary. Store in the refrigerator until using. 2. Once cupcakes are done cooking, let them sit and cool. 3. Frost cupcakes. Top with pomegranate seeds.